← The Color of His Shoes. Really? Growing up, we knew we were getting close to the edge with my mom when she would raise her voice in the middle of our antics and say, “Enough is enough.” That was our cue to either settle down or take it outside. 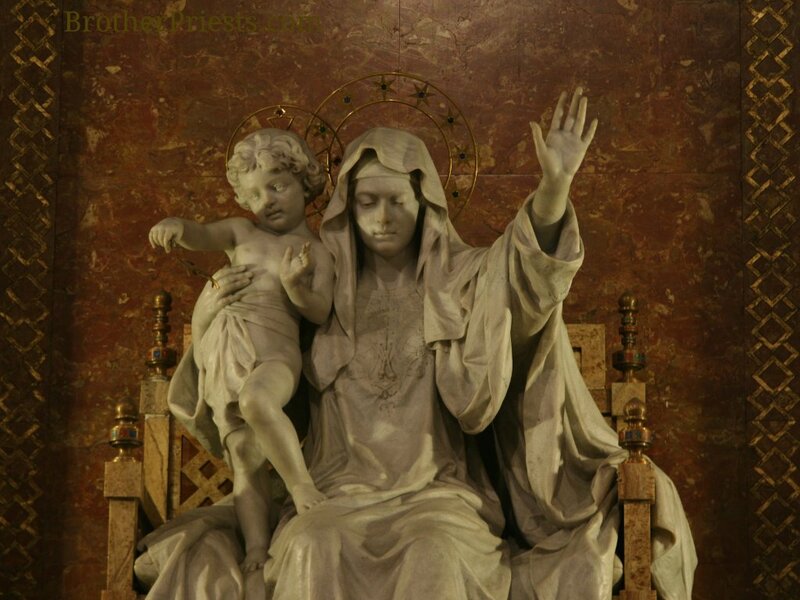 Although I’m sure that’s not what the sculptor of the amazing Regina Pacis statue at St. Mary Major Church in Rome had in mind, that’s the first thing I thought of when I saw the statue in 2005. It seemed to me that Blessed Mother was raising her hand to her children and saying, “Enough!” or “Basta!” in Italian. And who could blame her? I have thought often of that statue during this last historic week for our Church. Just a week ago, many (most?) of Mary’s children were proclaiming what the “Church needed” and prognosticating about who, exactly, should be the Pope to accomplish that goal. To a man, they were all wrong. Turns out, the Holy Spirit isn’t in need of any of us to tell Him what the Church, the Body of Christ on earth, needs at this point in history. The fact that every prognosticator was wrong hasn’t seemed to dissuade them at all though. During the last 4 days since the election of Pope Francis, Mary’s noisy children have continued with their cacophony of opinions of what Pope Francis needs to do unabated. This morning, March 17, 2013, at the Church of St. Anne in Vatican City, Pope Francis encouraged the parishioners there to listen to Jesus with the ears of their hearts so as not to end up like the people who brought the woman caught in adultery to the Lord for judgement. These people believed in the Law and believed in God but, above all else, they believed in themselves. This idolatry made them deaf to Jesus’ Message of Mercy. Our Papa Francesco pointed out that both the Pharisees and the woman in need of mercy exist in all our hearts and that, if we refuse to hear the Message of Mercy, we refuse to follow God. Like the Pharisees, we are all in love with our own agendas. Because this Pope seems to have a heart for the poor, the folks on the left are rejoicing. Because this Pope seems less concerned about liturgical issues, the folks on the right are wringing their hands. Because this Pope will not, because he cannot, reverse the Church’s teaching on moral issues, those with Pelvic Obsessive Disorder are upset. Adherents to the agendas from SSPX to the LCSW, from liberation theology to Greenpeace, from Islam to atheists have felt free to weigh in, at length, about what this good Pope should and should not do. And, like the Pharisees, we will lose our souls for eternity if we keep it up. It is time to follow our Holy Father who is following Jesus. We are not asked to come up with our own teaching, our own platforms, our own two cents worth. We are asked to have the humility and simplicity to simply listen to God who speaks to us through the Church and to follow our chief Pastor the best we can. This morning Pope Francis concluded his homily by stating that God doesn’t tire of forgiving us, it is we who tire of asking for forgiveness. Let us humbly ask God to forgive us of our possessiveness, our attachments to our own little kingdoms, our own wounds and honors at whose altars we worship everyday. 2 Responses to Basta Mama! One thing I just realized about Pope Francis is that he has not said one negative thing. Pretty cool. The ability to speak the truth without being negative is a great gift. Amen, sista! I have all I can do to learn that one thing from him.